Ride your City in Style and E-smart! 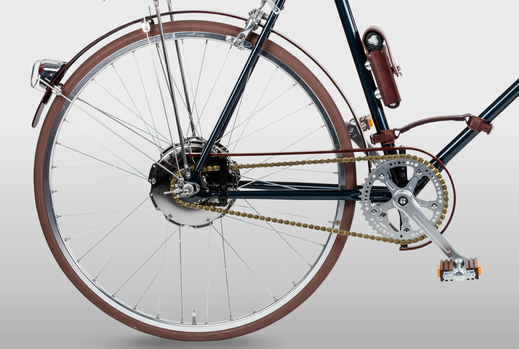 At first sight you would not guess that our velocipede-fogliaverde bikes are full fledged E-bikes. But they are! Hardly visible, the award winning and innovative E-hub with integrated battery from Zehus gets you ready for the smartest and most stylish City ride - no sweat, even in business attire. And the best: the system is regenerating, recuperating energy e.g. when you race downhill. In the ideal case, the system does not need to be plugged in. That's what we call intelligent. The system uses advanced torque and slope sensors rather than a traditional axis sensor. So the engine supports you only when the system detects that you need a boost. That's E-smart. This technology optimizes your efficiency and reduces your own efforts by 30-40%. Despite being designed as single speed bikes, hills are no challenge anymore. Where is the battery? Efficient and beautiful all-in-one design. No disturbing wiring or visible external battery. All necessary components are contained in the tiny and elegant rear hub, including brushless motor, batteries, electronics and sensors. Everything stays within 180 mm diameter in an elegant chrome plated aluminum housing. Including batteries a total weight of just 3 kg (6.6 lb.). The system uses advanced torque and slope sensors rather than a traditional axis sensor. So when set to th Bike+ hybrid mode, the engine supports the rider only when he needs power to accelerate or to ride up-hill. Because of this intelligent support, a lower capacity battery can be used that is lighter and much more efficient. The award winning E-hub represents the next generation of E-Technology! With a velocipede-fogliaverde bike you have an E-smart bike that, when set to the hybrid Bike+ mode, does not need to be recharged! The engine supports you when you need it during strenuous actions (start, acceleration, up-hill) and recovers energy (kinetic energy recovery system KERS) in situations where you do not need support (braking, downhill, speed above 25 km/h). It is the first non-plugin parallel hybrid E-hub on the market! With your smartphone you take control. Low energy consuming bluetooth connectivity allows you to connect your smartphone (iOS an Android) to the E-hub. 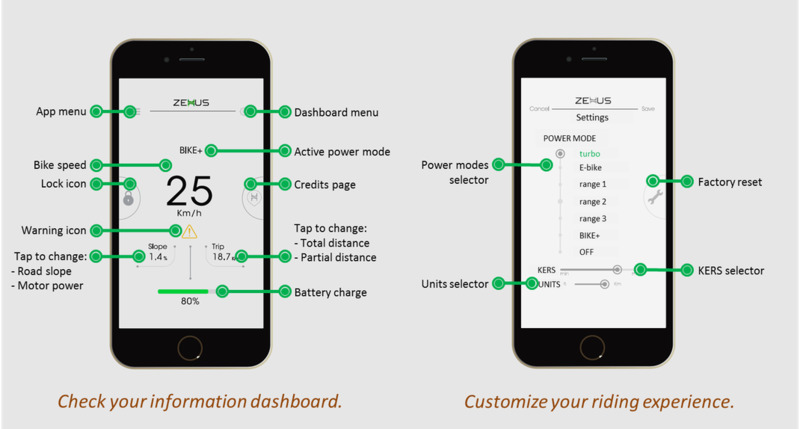 From seven different pre-defined settings you select your favorite power mode and fitness benefit, you manage your trip data and even lock your bike. Your smartphone also acts as a gateway, allowing you access to services such as online diagnosis, bike oriented navigation or mobility statistics. Battery: 30V Li-Ion, 160 Wh. Weight: 3 kg (7 lb.). Max. supported speed: 25 km/h (16 mph). The cut-off at 25 km/h (16 mph) makes the velocipede-fogliaverde a normal bicycle in European Union legal terms. This means there is no legal requirement for additional insurance cover or a license plate and no obligation to wear a helmet (even though we recommend wearing one for your own safety whenever riding your bicycle).